Life seems to be a lot of catching up these days! Hard to believe that I have been home from Quilt Canada for almost 2 weeks. It has been a whirlwind of a couple of weeks too! 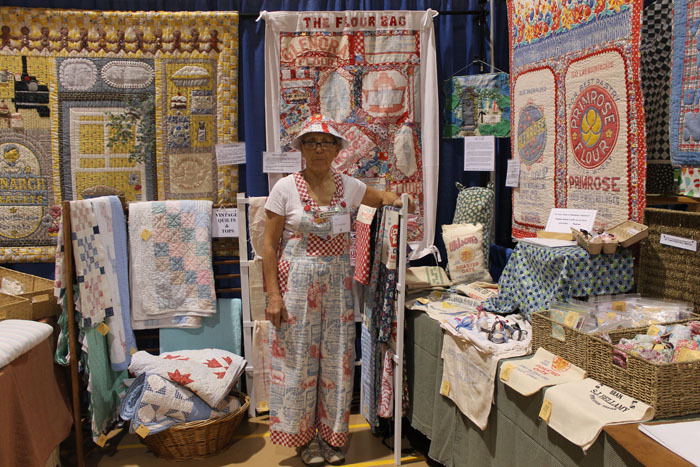 Quilt Canada was great! Thanks to the Local Organizing Committee headed up by Karen Henry and the workshop organizers Deanne Hemphill and Fiona Oxford. 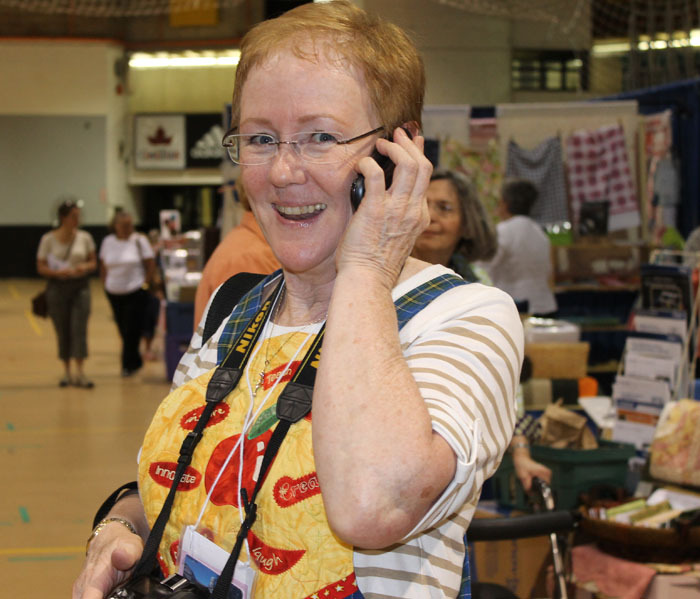 Deanne managing her phone and her camera, a quilter of many talents! 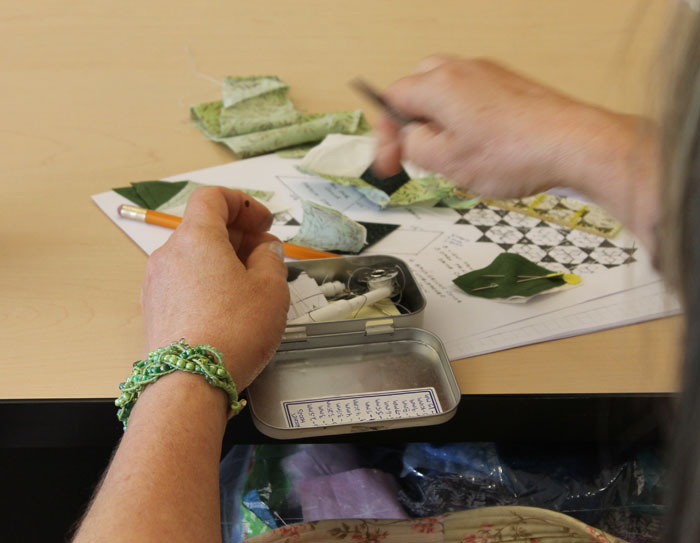 My classes were great and I seemed to have students from across Canada, Newfoundland to the Northwest Territories and everywhere in between as well as Wales and the US! 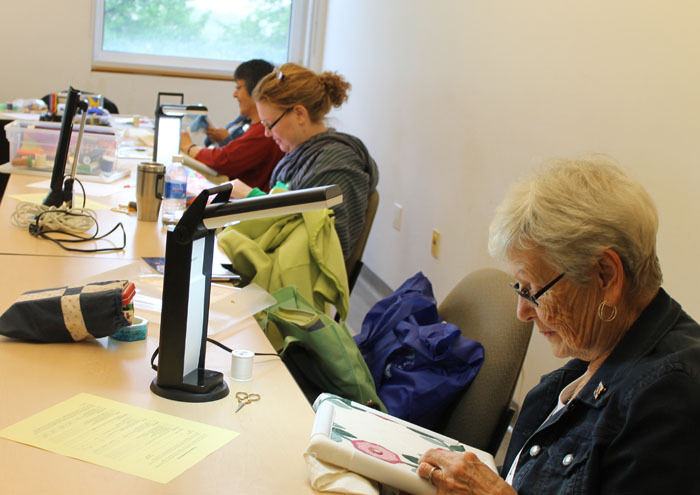 High level of concentration in my Stab Stitch quilting workshop. Learning to hand piece the Waternish Star, oh those tiny pieces! Hand appliqueing Running Around in Circles. It was great to see some familiar faces from past Quilt Canada's too. I was especially glad to spend some time with Kay Phillips and Nina Stahlsmicht. Nina specializes in all things feed sack! It was interesting being back at Dalhousie University, my alma mater. There were times when floods of memories came back and I just had to stop and remember and enjoy those great times. My only regret was there wasn't time to get together with the other teachers, I think I managed to speak to about half of them! I felt badly too as one of the NS teachers that we couldn't properly welcome our visiting teacher who came from across Canada, the US and the UK. Maybe next time! After QC, Heather Stewart stayed on for a 5 day visit with us. Heather (from ON) is a member of the MBQG and comes to NS whenever she can. 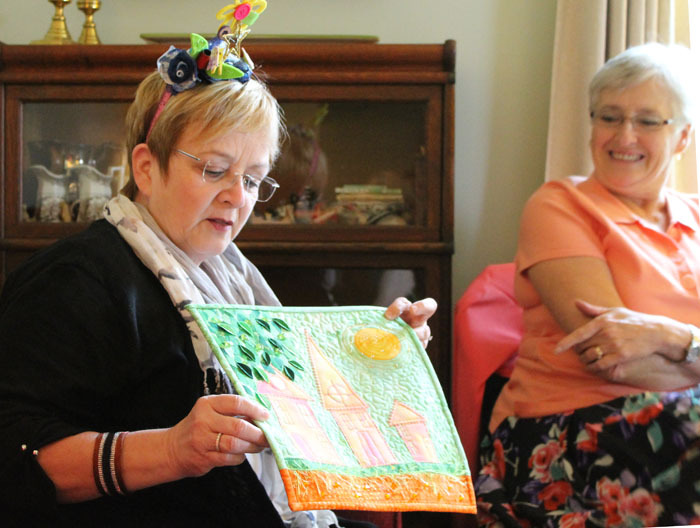 We had a great time visiting Avonport Discount Fabrics, our favourite lunch spot the Port Pub, our guild closing pot luck dinner and AGM and a lunch with our bee, the Cove Quilters. 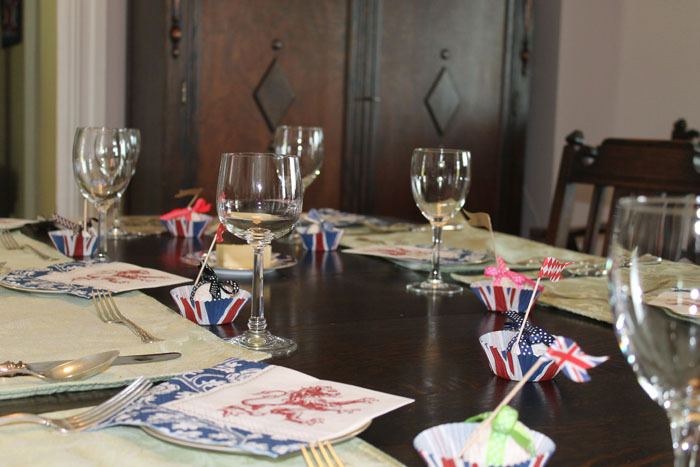 Thanks to my friend Cheryl Hughes in England we were able to decorate the table for the Queen's Diamond Jubilee, had I thought of it earlier we could have had a lovely tiara as a centre piece! Linda, Sandra, Sandy, Jane and Heather. 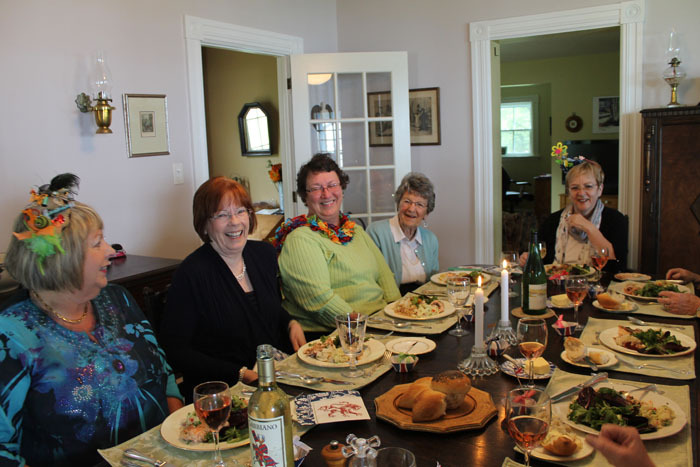 Thanks to everyone for their contributions, we had a delicious lunch! Heather reveals her challenge, house paint with handpainted fabrics. Note her fascinator she is wearing, made by Linda Mills! We had another reveal day for our bee 12x12 challenge. This was a challenge for many this time and everyone came through with flying colours! The theme was house paint. Everyone received 2 paint chips which were randomly chosen and had to use those to be inspired using the theme house paint, paint the town or painted ladies. Top row, left to right - Heather, Linda H, Sandra; middle row - Linda M and Vicki; bottom row - Sandy, Barb and Donna. 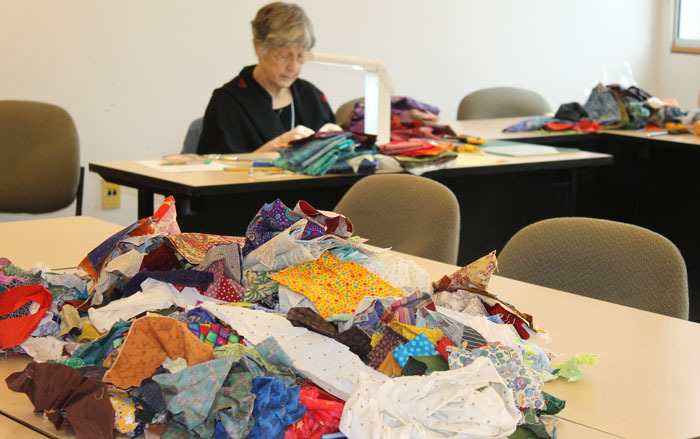 We are entering our all our challenges in our MBQG Quilt Show September 27-30, 2013. The challenge will be just how to hang/show them? The next challenge is to be inspired by a favourite book, That is a tough one as there are so many! Those will be revealed in September in time for the Quilt Show at the end of the month.